You can't turn a corner in Monaco without seeing a sculpture. It's rich, rich, rich in beautiful art, often by famous sculptors. And not just outside. You'll find work inside hotels and shopping centres too. The Metropole Centre always has an exhibition throughout its various levels. This summer the featured artist is the ceramicist, Jacky Colville. This piece is called Banc 'Loup Garou' - banc is French for bench. A Loup Garou is a werewolf. At first, I cropped this photograph to eliminate the background but somehow it shows itself off better with a bit of space around it - and anyway, look at the beautiful marble floor. It's nine in the morning - you see Cap Martin, the hills of Menton. Italy is just beyond. We are in the main port of Monaco - Port Hercule. The sun is already quite hot. On the larger yachts, crew members are busy cleaning. The fishermen have brought in their catch. Visitors are still sleeping or perhaps breakfasting on their terraces. They teach 'em to love baguettes young in France. The mother of this little one runs one of the stalls at the Funfair on the port. Baby sat outside happily chewing on his bread. With all the boats and super-yachts in Port Hercule in Monte Carlo, it's sometimes hard to remember there are fishing boats too. This was taken at 9 in the morning - the catch is in and now the fisherman (click to enlarge) is sorting his nets. It's dusk, hence the poor light. Soon the yachts will be lit and Monte Carlo will resonate with the sounds of summer nightlife. Here you see the I Love Fashion TV boat. Each year you'll find the Bungee bouncers at the Funfair on the port of Monaco. This year tho, it's in a different place to last year so in these photographs you see le rocher (the Rock) in the background. Last year, they bounced with a backdrop of the yachts in the harbour. Click on the link to see who was having fun then. There's still time to enter the competition posted on Menton Daily Photo yesterday. No one, so far, has come up with the correct answer - so do have a go. Each summer, on the esplanade in front of Port Hercule, you'll find all the fun of the fair. In the main photograph, the little boy has just finished swinging from one platform to another. He's so proud of himself. I watched him for a while whilst he was waiting his turn - very serious, watching those in front of him, obviously rather daunted. The small photo shows him before the adventure - just as he's about to move off the platform. There's a competition today on Menton Daily Photo. Do take a look and see if you know the answer. A postcard of Menton will go to the winner. Not the sharpest photograph in the world, but I wanted you to meet one of the men who clean up Larvotto Beach. It's just gone 8 in the morning and he whizzes along the jellyfish nets, checking for any damage. He also picks up any flotsam and jetsam in the sea. Larvotto Beach has had its publicity problems lately. Analyses of the water have shown a toxic algae called 'Ostreopsis Ovata' which has been menacing Larvotto Beach in particular. In fact all the beaches in Monaco are now under high surveillance. This algae, which has colonized parts the northern edge of the Mediterranean during the last few years, is a one-cell microscopic organism. Because it contains chlorophyll it's called an algae, but it's also a sort of plancton. Its natural habitat is on underwater rocks where it attaches itself to the rocks in the form of a brown mousse. The problem arises when this mousse detaches from the rocks and floats to the surface. In contact with the sun it gives off a toxic gas. Two years ago, in Italy - at Genoa - 200 people were intoxicated and hospitalised with respiratory problems. 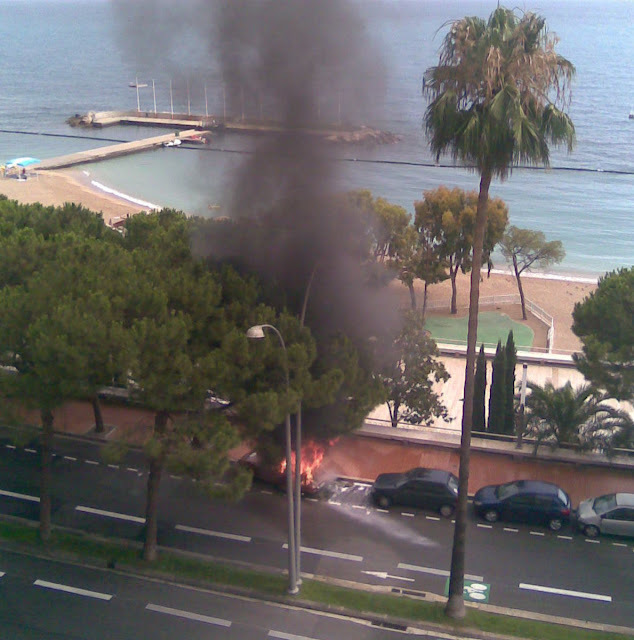 At the moment, the authorities say there is no danger in Monaco but the problem is being continually observed and tested by the zoological station in Villefranche, a laboratory at the University of Nice and the biology department attached to the Office of the Environment in Monaco. Meanwhile, as you see, people swim. Jellyfish! Lots of jellyfish! This sign is to be seen on Larvotto Beach. Tomorrow, we'll find out what they do about them. This sculpture stands outside the chapiteau (the circus tent) in Fontvieille. It was sculpted by Marcus Marin in 2006 and needs to be seen from a distance to properly see the face of the late Prince Rainier of Monaco. Shiny, immaculate yacht. Smart fenders. This boat is moored in the port of Fontvieille. Parc Sacha Guitry is a beautiful and peaceful park in Cap d'Ail - the town bordering Monaco - with its many stunning Belle Epoque buildings and wondrous views. It's a place too with a real village/community feel to it. "More than any other restaurant in Monte Carlo, Rampoldi is linked to the charming but somewhat dated interpretation of La Dolce Vita. Opened in the 1950s at the edge of the Casino Gardens and staffed with a mix of old and new, it's more Italian than French in spirit. It also serves some of the best cuisine in Monte Carlo. Menu items include an array pastas, such as tortelloni with cream and white truffle sauce; sea bass roasted in a salt crust; ravioli stuffed with crayfish; and veal kidneys in Madeira sauce. Crêpes suzette makes a spectacular finish." I'd go along with that. I've been lucky enough to eat here a few times in the past, but happily when someone else was paying. It's not cheap but it's very good. Great place to watch the 'beautiful people' if you can tear your eyes away from the food, that is. I don't know the name of this sculpture/fountain - Falling Water would seem to be a good name but then Fallingwater is the name of the famous house in Pennsylvania, designed by Frank Lloyd Wright, so I've called this post Water Falling. 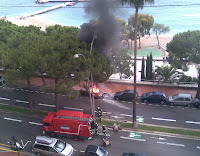 It stands in front of an apartment block in the smaller port in Monaco - in Fontvieille. Perhaps I simply missed the name plate and someone seeing this will tell us. There's something very peaceful about watching the water fall, fall, fall. Meet Adam and Eve - one of my favourites of the many sculptures in Monaco. By Fernando Botero and sculpted in 1981. It's a sculpture that people love being photographed with - the lady usually clutching a certain part of Adam's anatomy and giggling. Adam and Eve stand in the gardens below the Casino. This was taken in Casino Square. The traffic was snarled up and this man was chatting to the doorman of the Casino - they obviously knew each other. This Monte Carlo Gentleman is a gardener - as per the sign on his small truck. The interior of the beautiful Eglise Saint Nicolas in Fontvielle. I'm not always a fan of new churches but like this one, love the interior with the mural representing the buildings you see in Fontvieille - the area of Monaco reclaimed from the sea. You can read the history of this church and see the the exterior by clicking on the link. The old olive oil mill we've been looking at during the last few days is located on the opposite side of the place to this church. The smaller photo will give more detail of the mural - please click to enlarge. Here you see the double olive press, which produced the première pression of olive oil. This relic from Roman times is now displayed in Fontvieille. See the last two postings for more on the olive oil mill of Monte Carlo. Recommended reading: The Olive Route by Carol Drinkwater. Actress Carol Drinkwater is probably best known for her role as Helen Herriot in All Creatures Great and Small. Also an accomplished novelist she has achieved best-selling status with her trilogy of life on her olive farm in Provence. The Olive Route is her fourth book. Click on the link to read more. Here you see the double millstone. See yesterday's post for more on this relic from Roman times - the olive oil mill of Monte Carlo. The smaller photograph shows the millstone from a different angle, looking down on the square. On the far side is the church and on the left - the police station. You can just see the fountain in the centre. A better view of the fountain is seen by clicking on the link. Fragments of an olive oil mill from Roman times are displayed here in Fontvieille - the part of Monaco reclaimed from the sea. The original mill was in the area of Monaco known, unsurprisingly, as Moulins. What you see here are the remains of vats and millstones. How many toys does one guy need? The yacht, two different styles of car, as you see. I don't see a helicopter on this yacht. Don't have a go at me for the excess - I'm just the photographer. Today's Theme Day is a sign saying NO. This sign fairly well typifies what you'll find if you walk alongside the super yachts in the harbour in Monte Carlo. And as I'm currently in America, I've added the smaller photograph. Taken outside Otterbein College in Westerville, Ohio, it shocked me. Just that such a sign is even necessary horrifies. Ohio recently passed a Concealed Carry Law, and seemingly if you have a CCL permit, you can carry a gun - concealed on your person - but not where you see this sign. There are 171 cities throughout the world taking part in today's Theme. Do click here to view thumbnails and see how others have interpreted the theme. I'm flying from Columbus, Ohio to St. George, Utah (three flights) today so am really sorry but commenting will not be possible. I'll catch up over the next day or so and meanwhile thank everyone who has left a comment.